Adaptogens are a unique class of herbs used in Chinese and Ayurvedic traditional medicine for centuries that help you adapt to the effects of stress you’re experiencing and restore your body once it has passed. They work to bring your adrenal system back into balance, helping you to overcome the mental, physical and emotional impact of stress such as fatigue, brain fog, anxiety and suppressed immune function and increasing your endurance. They do this by influencing the hypothalamic-pituitary-adrenal (HPA) axis and the sympathoadrenal system, modulating the release of stress hormones such as cortisol. Each herb will have its own personality! This could be calming the body to aid relaxation and improve sleep or stimulating the mind to help memory and concentration if exhausted or even balance blood sugar by reducing sugar cravings. This means that different adaptogens suit different people. The list below will provide an overview of the most popular adaptogens. 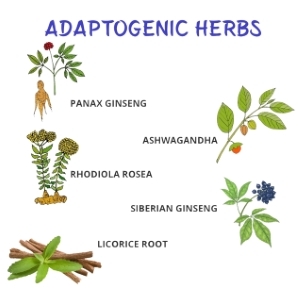 Adaptogens can be taken as a capsule, natural herbal extracts or tincture, by sipping a tea or adding the powdered herb to a smoothie, soup or latte, depending on the herb and natural taste. It is best to consult a qualified practitioner for advice. To achieve maximum benefit, adaptogens should not be taken indefinitely. I find them most effective when you take a break. Take free day once a week and only take for three months then have a month off. Often referred to as Indian Ginseng, this traditional ayurvedic herb can be helpful for long-term stress due to its soothing properties. This restorative herb has been shown to calm the mind, reduce anxiety, enhance sleep and reenergise. It not only supports the HPA axis but also provides powerful support for the thyroid gland. Astragalus root improves the stress response. It adapts adrenal activity according to the degree of stress being experienced; temporarily increasing the release of cortisol when the situation demands then returning the body to balance when passed. This makes it a valuable supplement when stress is intermittent. These mushrooms have been used in traditional Chinese medicine for over 1500 years. They are renowned for their ability to increase energy and stamina so helpful when experiencing fatigue, brain fog, dizziness, memory loss and low libido. They are a good source of antioxidants and ant-ageing. Known as Siberian Ginseng, eleuthero has been used as an uplifting and stimulating herb which fights fatigue, depression and stress for at least 2000 years in China. It is suitable for men and women and particularly beneficial as cognitive support for the elderly. It may be helpful for people working long, erratic hours who seek good quality sleep. Helps with fatigue and endurance. This root is rich in flavonoids and saponins and particularly helpful for immune-related conditions and inflammation. It may raise blood pressure so should be avoided if experiencing high blood pressure. Maca is like a highly nutritious tonic thanks to being rich in trace nutrients. Often referred to as Peruvian Ginseng as it is grown in Peru, it helps moderate stress and rebalance the body. It has hormone-balancing properties for men and women, increasing libido and fertility, particularly sperm count and relieves premenstrual tension and perimenopausal symptoms. Panax Ginseng is a potent herb particularly suitable for men as a physical and mental tonic. It has been shown to improve physical endurance, cognitive performance, memory and enhance mood. Rhodiola Rosea (golden root) is a powerful adaptogenic used by Sherpas working on Mount Everest. This mood boosting herb enhances physical performance, mental energy and reduces depressive symptoms. It has been shown to be particularly helpful in enhancing memory, focus, concentrate and energy in people experiencing adrenal fatigue. Used in traditional Chinese medicine, Schisandra is a useful herb for athletes looking to improve stamina, concentration and endurance when struggling with fatigue. Tulsi, also called Holy Basil, has been used in India for over 3000 years for good health. It is known to enhance the body’s natural response to stress and protects from the impact of the ‘fight-flight’ response. For example, it normalises blood sugar and blood fats and is good for calming a busy mind and overcoming brain fog. Learn more about dealing with stress in my best-selling book, ‘How to Prevent Burnout’ and my latest book, ‘Life Force. The revolutionary 7-step plan for optimum energy’.